First established in December 2011, Anonibet was one of the first Bitcoin sports wagering sites on the market and has been successfully running ever since. As evidenced by their name, they offer complete anonymity for players seeking to place wagers online for sporting events. They seek to provide players quite a selection of events to place wagers on, but mostly seem to be geared towards more European and international selections. While they do offer selections on some sporting leagues lcated in the US, they do not allow an account to be made under a IP that is located in the United States. That aside, Anonibet is clearly a top choice for most players as evidenced by outstanding player feedback and an overall presence of customer support. Anonibet provides players who are registered, the ability to wager on an array of different sporting events from basketball, soccer, handball, tennis, and a lot more types of sports. As mentioned earlier, Anonibet seems to be geared more towards leagues that are mostly played in Europe, as the selections are much higher in quantity when it comes to that particular region of the world. While Europe is the most frequent continent that Anonibet services for the selections they provide their players, they do also offer a bit of international selections and do seem to cover most of the major professional leagues that the US provides with NHL, NBA, NFL and MLB. That being said, Anonibet tends to have delays in posting lines and prices for non-European leagues until close to that particular event’s start time. Players seeking overnight lines for the next days games, like most other casinos provide, will not be too pleased with the long delay that Anonibet surprising has, especially considering that early prices are what most avid sports bettors seek to really enjoy. Players only seeking events played in a European country, will have no problem seeking an early selection, even for lower leagues within a certain country (I.E. Spanish Segunda Division). Anonibet provides two ways of placing a bet: Single Bet or Multiple Bet (Parlays). Once again, Anonibet seems to be a little behind the times in this regard, due to other sites providing such methods as teasers and pleasers. While most players do tend to only use either a single bet slip, or a multi-bet slip, having more betting options would possibly add a lot of value to the already popular site. Overall though, Anonibet is a good place to play for players just seeking a very simplistic and more European driven sports betting site. Banking is done using strictly Bitcoin for deposits and withdrawals and recently due to some wallet problems, both have to be done manually, but should be back to nearly instant within the near future. Anonibet does provide the option to have an account balance listed in USD, but only for the sake of being able to keep a tab of an actual dollar value, for the player’s benefit. No USD can be used for either depositing or withdrawing. Customer support at Anonibet is one of the best in the industry due to how they are always seeking to provide answers to customers questions through live chat. When a player first logs on to Anonibet, they are immediately given an opportunity to chat with a live chat representative in a pop-up box. Chat agents are available 24/7, and never usually take more than 60-90 seconds to respond to any inquiry that a customer may have. All questions are always provided with detailed and thorough response, and are always answered in a professional manner. Anonibet support is clearly at the top when it comes to speed, professionalism, and overall quality of support. Since 2011, Anonibet has been a groundbreaking sports wagering site that has provided the Bitcoin community the availability to wager with Bitcoin, without players having to provide any identifiable information other than an email address. Although Anonibet seems to be geared more towards players located outside of the United States, they do provide selections within the US sporting world, but not as quickly if the event were to be held in a European location. While there may be a downfall for players looking for action on an early line, it shouldn’t take away from the fact that Anonibet provides an extreme amount of support and has had no problems since they first opened back in 2011. Anonibet strives to be a place for Bitcoin gamblers to place a wager on a sporting event, that doesn’t need more than a couple of options on what type of wager to place. 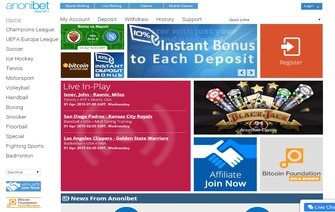 Bonus Anonibet gives away a generous 10% bonus for every new deposit! The more you deposit the more you could potentially earn in free cash!